An early start today to head on south a further 40 miles back to Musket Cove. 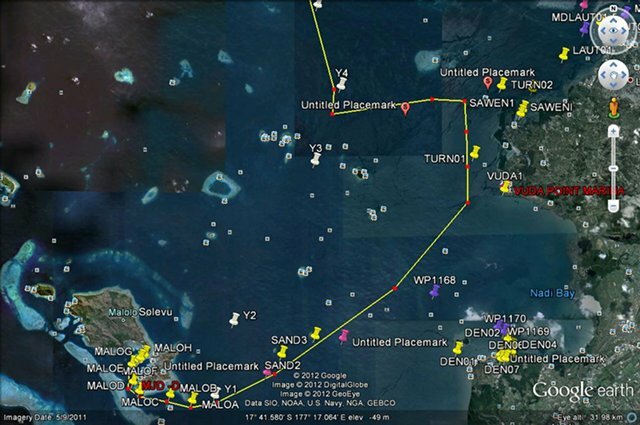 We have a berth booked at Port Denarau next Tuesday for 5 days to service the engine, re-provision and re-fuel, and get the boat ready for the next major leg of our passage, to Vanuatu, 450 miles to the west. Not wanting to risk a long trip to get to Port Denarau on Tuesday, we headed for Musket Cove which is only 11 or so miles away from Port Denarau. The wind was supposed to be SE 15-20kts, and it was for a short while, allowing us to sail close hauled. But it didn't last long and moved SSE and even S at times, so it was a motor sail the whole way into a nasty choppy sea. It wasn't big (no more than 2 to 3ft) and we would get up to 6kts quite easily, but then encounter 4 or 5 really steep waves that slowed the boat, even with the momentum of 20 tons, down to 3 to 4kts. She would then build up speed again until the next batch of over steep waves, and this went on for several hours. The final turn, with Musket Cove about 10 miles away, was right into wind and it was an easy decision to change destinations to Saweni Bay on the mainland, no more than 7 miles away with the wind behind the beam. At least it was for about 3 miles, then the wind died completely and with 2 miles to go we had 20kts from the NE and then N - a change of 180 degrees within a few miles. We could still sail okay, but Saweni Bay is open to the north, so not a good place to spend the night. So it was a turn back to the south with the potential of anchoring off Port Denarau, but the wind was still in the north and it looked lumpy in the bay. Okay, where to next? Let's try Musket Cove again (now about 12 miles away) as the wind is behind us, and so we did, sailing goose-winged with the wind dead astern. At least it was for about 5 miles. It then died and within a few minutes we had 15 to 18kts from the SE again. Having made a detour of 10 miles, SE was still good to sail, but it left us wondering what on earth was going on and who we had upset! But we made it just after 17.00, a couple of hours after good reef spotting time, but we followed our previous course in. Thinking about the change in wind directions, we've come to the conclusion that in a strong southeasterly the wind is slowed as it goes round the main island of Fiji. As the SE wind passes to the north of Fiji it gets bent round to come from the NE or N on the west side of the island, and the wind forced to go round the south of Fiji is bent round to come from the SSE or S on the west side. So there's a narrow gap where there's no wind. Go north a bit and the wind comes from the NE or N, go south a bit and it comes from the SSE or S. That would explain what we encountered. It wasn't the most enjoyable passage, even with the sun shinning most of the day. The last part of our roundabout route to Musket Cove.